Ready for take-off: Ed “KTOWN” Knouse gets ready to hit the sky in his Pietenpol Air Camper during a Plane Crazy event at the Mojave Air and Space Park. Knouse plans on flying his Pietenpol to Oshkosh, Wisc., this summer. He recently hit 1,000 hours flying Lockheed Martin’s U-2 “Dragon Lady” and has more than 3,400 hours in 14 different aircraft. 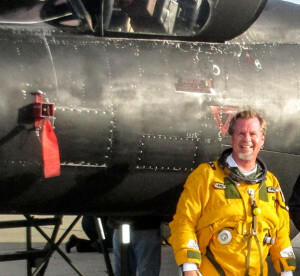 Ed “KTOWN” Knouse, 56, achieved the 1,000-hour milestone in the U-2 “Dragon Lady” while flying a high-altitude, test mission in the early morning hours of Nov. 28, 2018. The aircraft is capable of flying at over 70,000 feet. A typical operational reconnaissance mission may last ten plus hours and can cover more than 3,000 miles, gathering vital intelligence. “When you’re operational, every mission is real world — we are collecting the critical information needed to protect our warfighters. With test missions we strive to provide the war fighter with the most cutting edge, quality aircraft to perform that mission,” said Knouse. Knouse, or KTOWN, as he prefers to be called, likens flying the U-2 to sitting in a car for nine hours while wearing a snowmobile suit, thick gloves, heavy boots and a fishbowl over your head, then jumping onto your bicycle with a 2x10x12 on the handle bars and pedaling 100 yards. “And all the while not being able to scratch your nose — but the view is absolutely spectacular!” he explained. Among his many accomplishments KTOWN is a retired colonel, having served 24 years in the U.S. Air Force with more than 3,400 total flying hours. As an F-16 instructor pilot, he logged more than 1,250 hours in A, B, C and D models. While working at the U.S. Embassy in Cairo, Egypt he accrued more than 350 hours in the C-12. 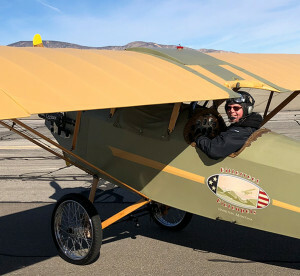 He has flown at least 14 different military and civilian aircraft including experimental homebuilt aircraft, flying several “first flights” for friends. A Forward Air Controller during the First Gulf War (Desert Shield/Desert Storm) serving with the 1st Calvary Division out of Fort Hood, Texas, he also flew as an active duty F-16 Instructor pilot with the Puerto Rico Air National Guard in San Juan. He served as a Joint Staff officer, working with the Navy at Dahlgren, Va., and was a U-2 Squadron Commander at an “undisclosed location” during Iraqi Freedom. His career culminated as the Chief, U.S. Liaison Office, Senior Defense Representative, and senior adviser to the ambassador at the U.S. Embassy in Abu Dhabi, United Arab Emirates. He has numerous awards and medals including a Bronze Star from his tour during the Gulf War and several Air Medals, including a single mission Air Medal for flying the first U-2 mission into Iraq after Saddam Hussein promised to shoot down the next U-2 to fly over his country. It’s quite an impressive resume, especially considering his journey into the Air Force started out by filling in an Air Force “AIM HIGH” advertisement in the TV Guide when he was a junior in high school — just to get his mother off of his back. Lockheed Martin U-2 pilot, Ed “KTOWN” Knouse, a retired U.S. Air Force colonel, has reached 1m000 hours flying Lockheed Martin’s U-2 Dragon Lady. Knouse received a single-mission Air Medal for flying the first U-2 mission into Iraq after Saddam Hussein promised to shoot down the next U-2 to fly over his country. The reconnaissance aircraft can fly 70,000 feet above the earth and missions can last more than 10 hours. Later, a letter arrived stating he was one of 13 candidates to interview for three open slots with his local congressman. Up until this time, his parents didn’t even know he had received the questionnaire or that he was even applying to the Academy. When KTOWN said he needed to borrow the car for an interview with the congressman, his father realized the magnitude of the situation and told him he needed a new suit and he had better cut his hair. “In those days driving 30 miles was like driving across country.” Showing up for the interview with 12 other candidates, he scanned the waiting room. “They all came with both parents, wearing nice three-piece suits, perfect haircuts, all their moms dripping with diamonds and here I am, pulling up in a “jacked-up” 1970 Cutlass Supreme, by myself in a powder blue, polyester suit, yellow ruffled prom shirt and bow tie, hair cut just enough to rest on my shoulders and my three-inch platform shoes. I swear, the only reason they chose me was because they wanted to use me as a social experiment,” he laughs. The only knowledge KTOWN had about the Air Force was from listening to his dad tell exciting and harrowing stories about his time in the Air Force while they were building a balsa wood Stuka Dive Bomber in the basement. 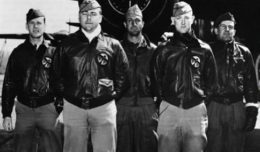 His father was a crew chief on B-29s during the Korean conflict. In his limited spare time he enjoys flying his open cockpit Pietenpol Air Camper. “I love it because you can smell the air, you can fly over someone, see their face and wave at each other.” He is currently completing another Pietenpol. “I’m 90 percent done — 12 years to go!” He is hoping to fly his flyable Piet to Brodhead, Wisc., for the 90th anniversary of the Pietenpol this summer and then tag along with a gaggle of other Pietenpolers to Oshkosh. KTOWN is also writing a book, a collection of vignettes of his military experiences titled, “If My Casio Could Talk,” in reference to the Casio calculator watch that he used to wear as a lieutenant F-16 pilot. KTOWN enjoys spending quality time with his beautiful, sassy British bride of 11 years, Diana, also known as “The Brit Chick,” who is a Louise Hay Therapist. Together they practice holistic living and are both life coaches.